PAX South, STEAM page and more! Oh man! What a week! We have so many things going on that I don’t even know where to start! 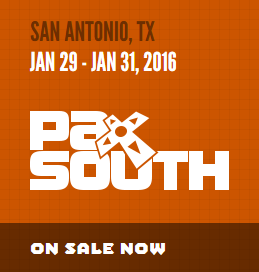 First of all, this weekend we will be at PAX South! Our friends at Devolver Digital are going to take us to the lovely San Antonio, Texas. Sebastian already was on PAX prime, so now it’s my turn to travel! But that’s not all! As one of the most amazing and bizarre-yet-on-topic promos ever, Devolver will be giving away their ENTIRE digital library of games on Steam to anyone demoing the game at PAX while wearing a toga! Okhlos will be playable at the upcoming PAX South inside the Devolver Digital booth  and any attendee that demos the game while wearing a toga or tunic will receive the entire Devolver Digital library of games on Steam. You would have to be out of your mind if you don’t steal your mother’s drapes and run to PAX to play OKHLOS! Remember, we will be at booth 12059, if anyone reading this is going to PAX, please come and say hi! I’d love to meet all of the people out there reading our mumbling! OKHLOS STEAM PAGE is up! 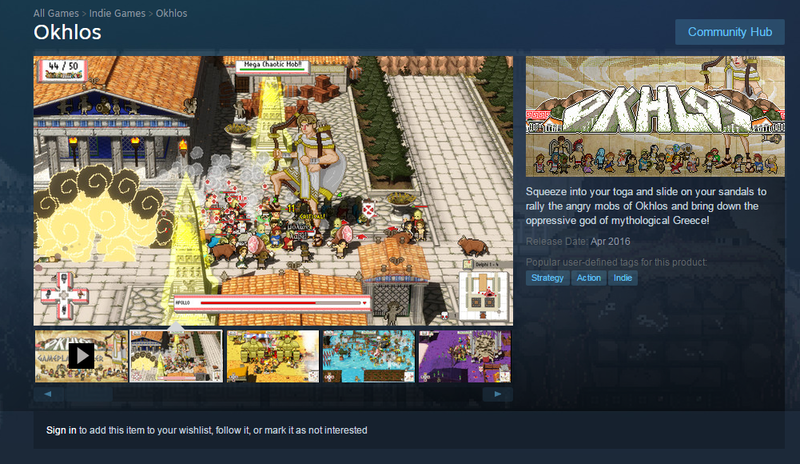 Now you can go to Steam an add Okhlos to your wishlist. Spam it to your friends and family! There are a few things that we’ve added to the page but they are not being shown. For instance, we have Full Controller Support, yet the web page refuses to accept our update. Same thing with Trading Cards. But you get the idea! And along with the new Steam page, we have NEW TRAILER! -In order for Kert to have enough clips, I captured 163GB of video. -The reason they were so large was because all the videos were running at 60fps, 1080p. -There were 217 individual clips. -It took me an entire day to capture all the footage for the first iteration of the trailer. After that we had to capture a few more particular shots, which expanded the capture time over two more days. -We had to heavy compress the videos using H264 in order to send the clips to Kert. -We spent an entire weekend uploading videos to Box and Dropbox. -We uploaded about 20gb worth of videos. Because this is a devblog (sort of), a word of advice: As you can see, the most important part when you are working on your trailer, is having TONS of footage. You want to show different moments of the game, different aspects, features, etc. So you need footage. Maybe a 5 minutes clip of a boss fight ends being used only for 2 seconds, but when you are editing, you are working for the video as a whole, and you are gonna discard a lot. So don’t be afraid of using the scissors! I ranted a long time ago about the peculiarities of doing an indie trailer here. After working with Kert, I can tell you that most of the things that I wrote back then are still useful. If you can’t literally spend a week or two doing the trailer, just hire Kert (don’t know if he is taking contract work, though!). Finally, on a more personal note, this week we bought our first font. For all of my games and design work, I’ve always used free fonts, but for Okhlos we are using Dalek, which can be used free for non commercial projects. We were planning on buying the font a few weeks before the game was out, but we decided to do it now, mostly because the trailer uses it. It feels weird to buy a font, mainly because you are buying the license. Is the kind of thing that people don’t put money into. On a high note, it also makes you think that you are a professional. It kinda resembles the first time I bought a digital game*. On a tremendously cooler note, the Dalek was designed by Keith Bates, which was Eccleston’s (ninth Doctor) art teacher! How cool is that?! 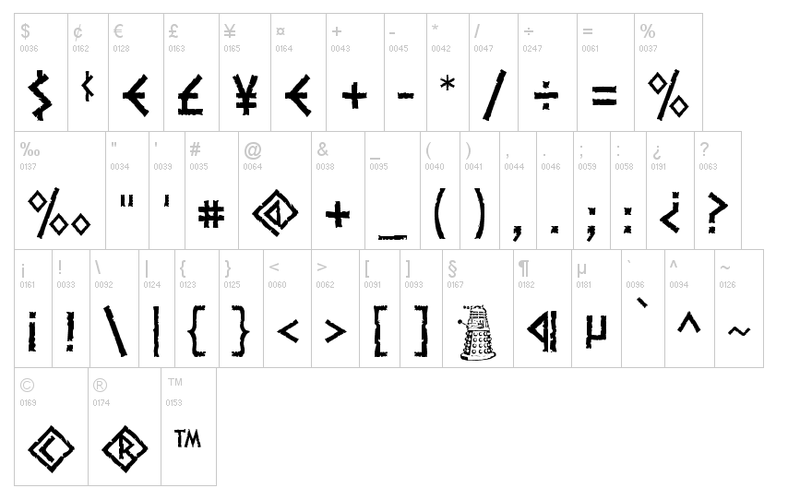 And look at the hidden glyph! Well, I think those are all the news we have for now! Remember to add the game to your wishlist and come to say hi if you are going to PAX! * I had a hard time trying to recall which was the first digital game I ever bought. I think that was Scott Pilgrim vs The world. The game itself is fine, but the art by Paul Robertson is amazing. All my games before that had been physical. Hi there and welcome back to the best blog ever*! Among the many things we have working on these last weeks, we made a full review of all the boss battles in Okhlos. We playtested them, took notes and then discussed what was working about them, what wasn’t and what we could do to improve them. It’s a lengthy process but a rewarding one. So we want to show you how we do this. And as a example, we chose to tell you about all the changes that one of those bosses has undergone: Hephaestus. Remember him? We introduced him back in one of our very first posts about the game, where we showed you the main antagonist in Okhlos, the hateful twelve Olympian gods. Hephaestus is Hera’s son, Aphrodite’s husband, and the god of blacksmiths, artisans, craftsmen, fire and volcanoes. He made all the cool weapons and gadgets the other gods and some heroes would wield, and he even made living machines, like the bronze giant Talos. All in all, a impressive chap. But back to the game. By the time of that post about the Olympian gods, we had already sketched out how Hephaestus was going to look and what he was going to do. It was very simple. He would have an area melee attack, which was smashing everyone around him with his hammer, also a ranged attack, throwing a lava boulder, and finally he would summon automatons, because he made them and lots of them lying around. But things couldn’t be so simple. After implementing a first version a playing a bit we found out that the battle against Hephaestus wasn’t as fun as it could be. One problem was that the combat ended up being too static. Asides from the melee attack, which you could block, there was really no reason to move the mob. The best strategy was to swarm the god and keep pounding on him, ignoring any of the enemies he summoned and never getting far enough for him to use his ranged attack. Not that much fun indeed. Hence, a new version of Hephaestus was born. So we had a boss battle that was too static, and a god with two thirds of his attacks rendered useless by the most simple of the player’s tactics. What’s the first thing to try if a battle against a boss is to static? Making him move! Right? Hephaestus already did move around the level, slowly, but he moved. So, make him faster? For one part that didn’t fit the theme, Hephaestus was supposed to be a crippled god, strong but not particularly nimble or agile. We even made him with a cane! But asides from that, if we made him faster the player would simply spend more time running around him, which was not particularly fun either. The solution we came up then was to set up a safe zone inside his arena, where he would go to summon his automatons. The area would be outside the mob’s reach so he could spend all the time he wanted invoking minion or preparing devastating ranged attacks. A classic villainous move! Leave the battlefield for a while, let your underlings entertain the heroes and then came back for a new round of evilness. Perfect! Or not. Even though this solution did work, and fixed the main issue while Hephaestus was in his safe area, the rest of the combat still felt pretty much the same. It now had a nice change of pace when Hephaestus went away to summon minions, but we set out to improve it even further. A new version was on the way. Around the time we were working on that version of Hephaestus as I was playing Titan Souls, an amazing game, as are all game published by the wonderful folks of Devolver Digital (blatant cross promotion – blatant cross promotion – blatant cross promotion). 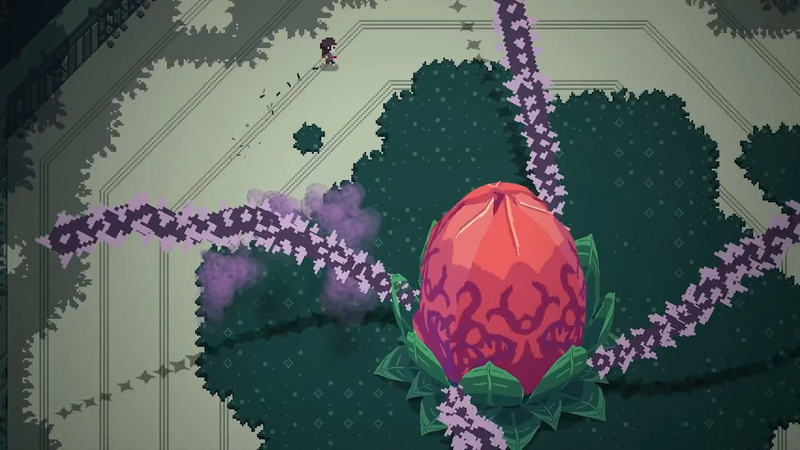 One of the bosses in Titan Souls is Vinethesis, plant-like creature that sits at the center of the level and spins around its spiked vines around. This boss seemed to have a problem similar to the one we faced with Hephaestus. The optimal way to beat him was to stand still and way for the right moment to shoot. However, the devs had came up with a way to make the player move. Vinethesis summons a cloud of poisonous spores that follows the player, and kills him if he stands still inside it. It was a great idea! So let’s rip it off I said … err… I mean, let’s pay homage to the great game by implementing this great solution to our problem instead of resorting to other boss fight’s tropes. And so we did. We made a cloud of flames and smoke that slowly moves toward the mob, damaging any person (or animals) that comes in contact with it. If the mob spends too much time swarming around Hephaestus, the cloud will move over him, providing him with the cover he needs to bring some minions or use his ranged attack. Sweet! And so everything was fine and we retired to an isolated Caribbean beach where we spent the rest of our days sipping cocktails and playing cards with an old fellow named Chachingo, right? Nope, we kept on playtesting Hephaestus battle and came up with a couple of things to improve. A new version was on the way. You remember that Hephaestus had a ranged attack, right? Throwing lava boulders at the mob? Well, up until now, Hephaestus wasn’t really able to use it that much, so that attack never got the chance to shine. Once Hephaestus started using it we realized that the attack had some issues of its own. No shining for you. First there was the problem of where to get those lava boulders. When we planned it we thought that since he was in a volcano level, he could just grab it from anywhere, but digging up some lava from the spot he was standing didn’t really look very well. Neither was a good idea going all the way to lava rivers at the edge of the scenario each time he wanted to make ranged attack. After a few tests we decided to go in a different direction: Hephaestus wouldn’t dig up chunks of lava to throw any more, he would now invoke a meteor shower to rain upon the unsuspecting mob. Same as effective, twice as shiny and godly. The other thing we changed in this version was how and when the smoke cloud appeared. At first it was almost an autonomous entity that was there in the level, it spawned when the battle began and stayed there until you defeated Hephaestus. What we did now was integrating into Hephaestus attacks. The cloud has finite lifespan but Hephaestus can summon another one whenever he needs it. Not a huge change but something that makes things more interesting. And, unless I am forgetting something else (which is entirely possible), those were all the changes that Hephaestus has been through until today. Is this the end of the story? Probably no. We’ve just started the closed beta and started getting feedback from players so we will probably do a fifth version, perhaps even a sixth version! 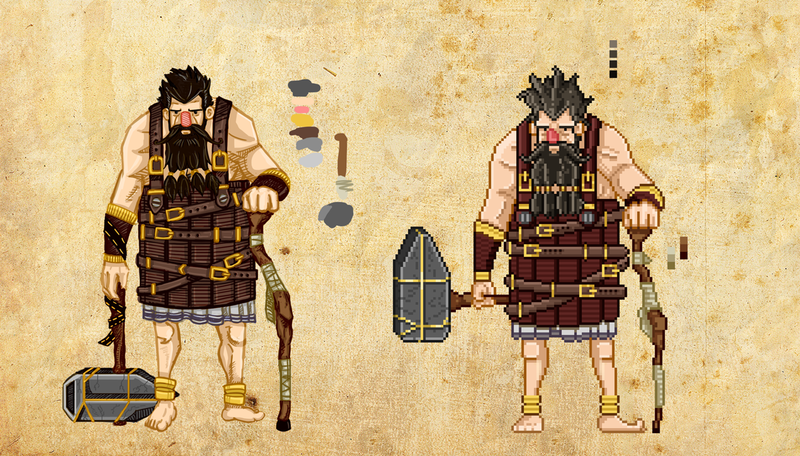 But we wanted to show you a little about the iterative process of designing the bosses in Okhlos. They have always been one of the biggest challenges in the development of the game so we want to make them as best as possible. 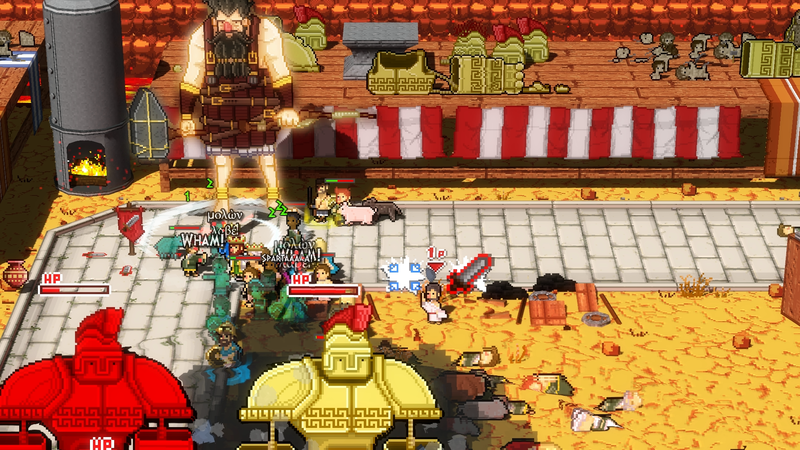 Okhlos’ Closed Beta is now live! If you are one the lucky and wise ones to have pre-ordered Okhlos, you now have the chance to enter the closed beta and try the game before everyone else! You will have the opportunity to gaze upon unfinished marvels, buggy bosses and misspelled hero names but at the same time you will be able to give feedback on your favorite/least favorite aspects of the game, chip in ideas and help make the game even better! How will I be able to do that, you say? If you pre-ordered the game, check your mail! All the instructions about how to get your key are there! If you DIDN’T receive the mail, let us know. Then, all of the beta participants will have access to a super secret forum where they can share all their thoughts, info and comments about the game! How cool is that?! If you do join the beta, a little disclaimer. Please, keep in mind that the game is not finished yet. So expect to find bugs, lots of things to polish and a few missing content we have yet to add. Also, we are starting the beta with a Steam PC version. Our plan is to soon support Mac/Linux version too, but is being a little more challenging than expected so it may take us a few more days to launch those version. Finally, if you haven’t pre-ordered the game, do not despair. Pre-orders are currently close, and it is very unlikely that we will open any new slots for the time being, but hang on a few more months. We are really close to announcing a launch date! 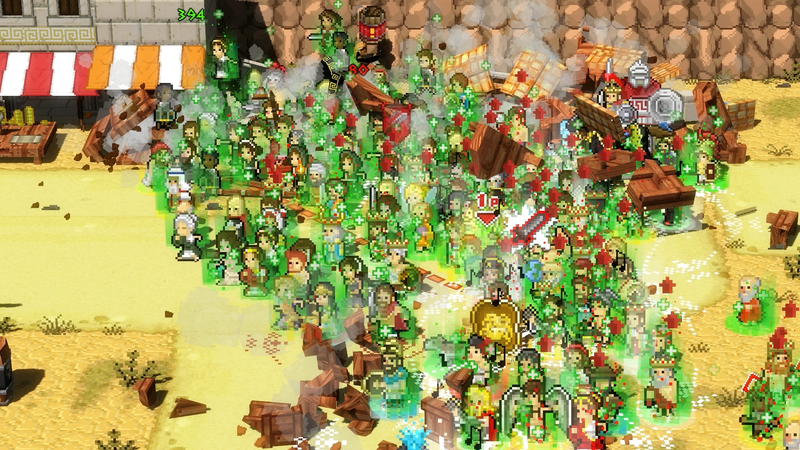 Also the beta will definitely help us improve Okhlos in many ways so it will be worth the wait! Now, to celebrate, here is a HUGE screen, showing over 200 units on screen (pure Chaos)! And some GIF magic about this magic moment. Keep in mind that this is a particularly big .Gif! It may take a while to load. So, that’s all! If you pre-ordered the game, and want to try the game, check your mail!